Andrei Vasilevskiy's second shutout in a week came with a little help from his friends on the penalty kill. The goaltender stopped 35 shots while helping to stifle six Dallas Stars power plays, and Ondrej Palat and Mikhail Sergachev scored for the Tampa Bay Lightning in a 2-0 victory Tuesday night. Vasilevskiy improved to 10-2-1 since his return from injury, posting his third shutout this season and the 15th of his career for the Lightning, who have an NHL-best 74 points. DALLAS (AP) — Andrei Vasilevskiy's second shutout in a week came with a little help from his friends on the penalty kill. The goaltender stopped 35 shots while helping to stifle six Dallas Stars power plays, and Ondrej Palat and Mikhail Sergachev scored for the Tampa Bay Lightning in a 2-0 victory Tuesday night. Vasilevskiy improved to 10-2-1 since his return from injury, posting his third shutout this season and the 15th of his career for the Lightning, who have an NHL-best 74 points. Four of the Dallas power-play chances came in the second period with Vasilevskiy protecting a 1-0 lead. "It's frustration first, and then you get energy after that," Lightning coach Jon Cooper said. "Guys were frustrated a little bit with the amount of calls that were going against us, but they're penalties. You've got to kill them off, and that's what we did." Palat gave Tampa Bay a first-period lead with his seventh goal, sending a shot over the glove of Anton Khudobin on a pass from Steven Stamkos, who got his 29th assist. Khudobin had 19 saves. Sergachev scored a 4-on-4 goal midway through the third period after Dallas captain Jamie Benn canceled out a Tampa Bay penalty for the second time. Benn was called for tripping just 13 seconds after the same penalty against the Lightning's Mathieu Joseph. The Stars had one more chance with the man advantage when Vasilevskiy was called for tripping with less than five minutes remaining. But Dallas could only get three shots from the perimeter in its third straight loss. "Guys felt good about their games during the game, and that's why they're so frustrated afterward because they know they had good looks and good chances," Stars coach Jim Montgomery said. "When you have a lot of good chances, it frustrates you more." The Lightning protected a 1-0 lead despite playing down a man most of the last half of the second period, when the Stars outshot Tampa Bay 13-2. The first penalty of the game was a double-minor on Victor Hedman for holding and unsportsmanlike conduct about midway through the second. The Stars had a chance for a 5-on-3 when Anthony Cerelli got a tripping penalty, but Benn was called for goalie interference during the delayed penalty, with Dallas skating 6 on 4. "Just backed up into the goalie," Benn said. "Probably a bad penalty to take when you're going on a 5 on 3." The best chance for the Stars on the long power play came with 13 seconds left when Alexander Radulov fed Radek Faksa just above the crease for a one-timer that Vasilevskiy corralled. "I think the main difference was for every penalty we kill off, you get a little more confidence and you feel good being out there," said defenseman Anton Stralman, who was on the ice on the penalty kill for a game-high 7:08 along with Ryan McDonagh. "I don't know if they got frustrated. We take pride in what we do out there, and tonight it paid off." Dallas didn't do much with Tampa Bay's fourth penalty of the second period, an interference call on Nikita Kucherov when he cut in front of Faksa as the Stars forward chased a loose puck into his offensive zone. NOTES: Former Dallas Cowboys receiver Dez Bryant attended, wearing a Stars jersey with his familiar No. 88 for the franchise's career leader in touchdown catches. Bryant called out the starting lineup in the locker room before the game. ... Andrew Cogliano made his Dallas debut a day after a trade that sent Devin Shore to Anaheim. Cogliano, who took Shore's No. 17, had no shots in 12 minutes. ... Kucherov, the NHL points leader with 75 (22 goals, 53 assists), was held scoreless in consecutive games for the third time this season. ... The Lightning, who were coming off a 5-1 loss to the New York Islanders, have dropped consecutive games just once this season. 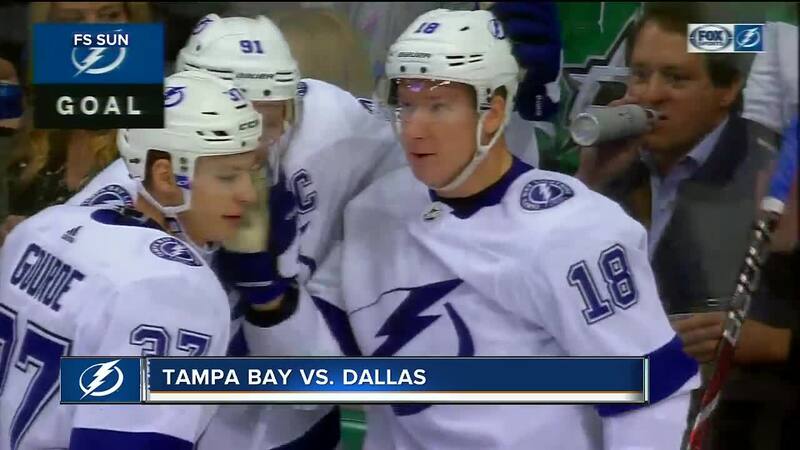 Lightning: Host the Toronto Maple Leafs on Thursday. Stars: Play the third game of a six-game homestand, their longest of the season, Thursday against the LA Kings.